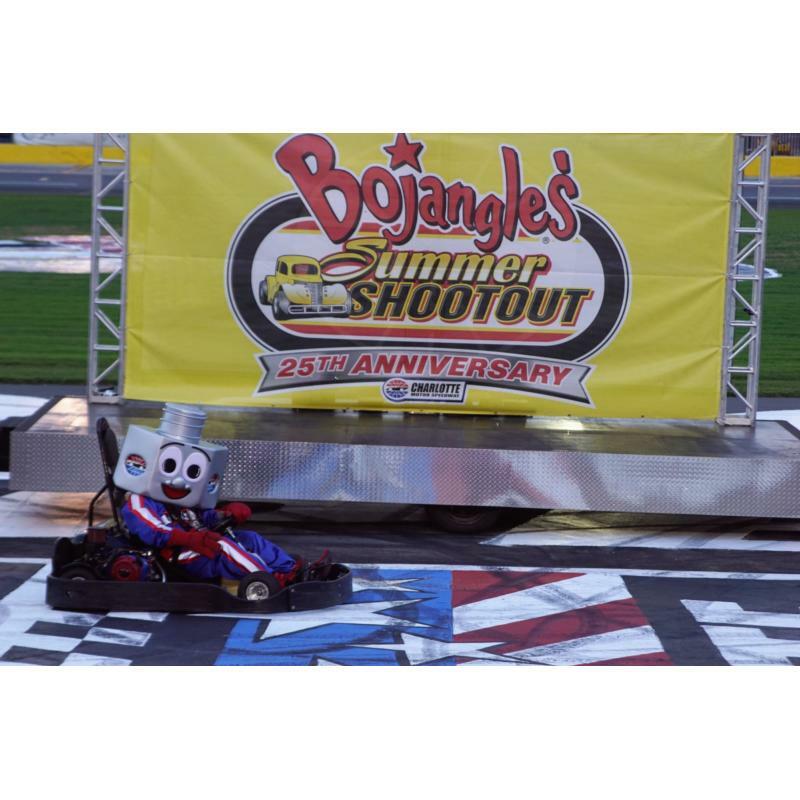 The Bojangles' Summer Shootout is two weeks from its first fireworks show, but sparks and fur flew on Tuesday in the series' third round of its 25th season at Charlotte Motor Speedway. 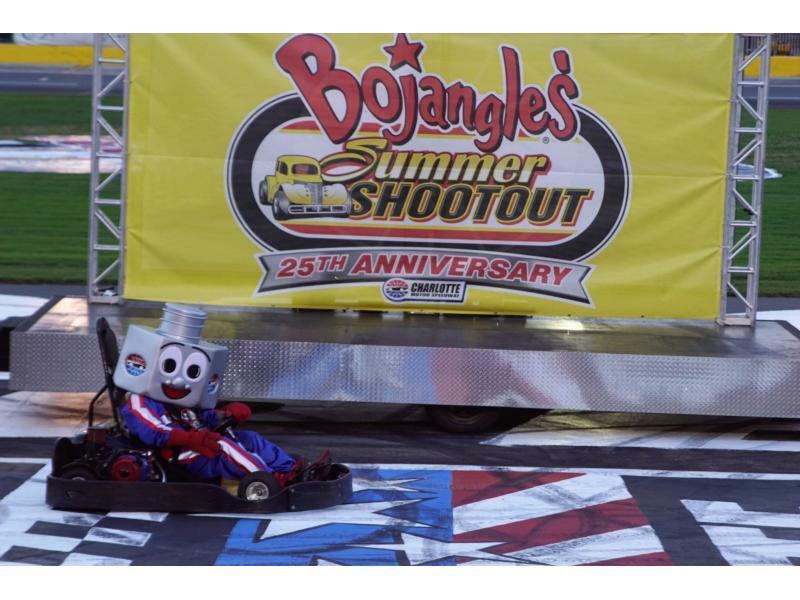 Putting the finishing touches on his 24th birthday celebration, Lug Nut - the world's fastest mascot - kept Lugette, Hugo the Hornet and Chubby Checker at bay in a no-holds-barred, go-kart extravaganza featuring mascots from the Charlotte Hornets, Charlotte Checkers, Charlotte Hounds, Cabarrus County Visitors Bureau, UNC-Charlotte, Bojangles' and the NASCAR Hall of Fame. The third of 10 nights of Legend Car and Bandolero action saw Carl "The Dragon" Cormier strike first in Cabarrus Brewing Company Masters division action. Cormier jumped out to an early lead with John Sossoman in tow, but a caution with 10 laps to go ignited a spectacular short-track finish. Sossoman and Robby Faggart - longtime friends - tangled in a battle for second, sending Sossoman's car spinning at the entrance of Turn 3. Sossoman leapt from his car, smashed his helmet into pieces and fired it at Faggart - who, only two laps later, went for a spin of his own after contact with Mark Green. Cormier stayed out of harm's way to register his first win of the season while Sossoman and Faggart had an animated post-race discussion. "I knew when I was out front, just don't make any mistakes," Cormier said. "Don't let them beat me. I just stayed focused and I made it to victory lane." Derek Lemke opened the win account for Ladyga Motorsports in Legend Car Pro competition, as the well-known black machine with a neon yellow No. 48 proved to be No. 1 in the third Pro race of the season. Lemke beat Dawson Cram to the finish line by 2.35 seconds as Cram held Sam Mayer at bay in the battle for second. "It's awesome to be racing out here and it's awesome to win," Lemke said. "I've got to give a big shoutout to everyone at Ladyga Motorsports for giving me the ride and the chance to race here. Hopefully we can get a few more of these." Drew Dollar avoided mayhem in an eventful VP Racing Fuels Semi-Pro feature. The driver of the silver No. 00 Legend Car pulled away from Sammy Smith, Gracie Trotter and Harrison Halder in the closing laps to log a well-deserved victory. Dollar's win was even more important since title contender D.J. Canipe was swept up in a crash while running fourth. Canipe was left with a 24th-place finish while Dollar enjoyed the spoils of victory. "Wherever we go, we race each other really clean," Dollar said of his battle with Smith. "I can't thank everyone who's helped me out enough." Justin Gareis moved to 3-for-3 in Charter Schools USA Bandolero Outlaw races this season in becoming the winner of seven consecutive Outlaw events. Gareis broke a 16-year-old record set by Scott Knox, who won six straight Bandolero Outlaw features in 2002. "I'm not thinking about that, I'm just thinking about finding a way to hit my marks and get this thing in victory lane," Gareis said after the race. "Everyone in this Outlaw field is so talented but as long as you're patient and you hit your marks, you can get there and win." Zack Miracle continued his strong start to the Bandolero Bandit season, as the driver of the No. 32 machine posted the fastest lap of the race - 18.54-seconds - en route to winning the feature by 1.65 seconds over Landon Rapp. Due to a rash of accidents and caution periods, the K1 Speed Young Lions race was shortened from 25 to 23 laps, but it was all "Good" with the winner. Tommy Good pulled away from Holt Halder and Bryson Ruff on the final restart to register the victory. 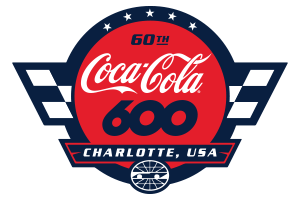 "It's a big stage, Charlotte Motor Speedway, because this is where the big guys race," said Good, who pulled off his first Legend Car win in Shootout competition at America's Home for Racing. "It's amazing to win here. It's a dream come true." In a spectacular Beginner Bandit feature, Alex Meggs held off Luke Morey in a photo finish. Morey made a last-ditch move to the inside in Turn 4 but Meggs prevailed by .023 seconds for his second victory in three tries. Cabarrus Brewing Company Masters (25 laps): 1. Carl Cormier; 2. Todd Midas; 3. Mark Green; 4. Jan Ingram; 5. Chip Ferguson; 6. Robby Faggart; 7. Rodney Tharp; 8. Bruce Silver; 9. Charles Parker; 10. Dwayne Halder; 11. John Sossoman. K1 Speed Young Lions (23 laps): 1. Tommy Good; 2. Holt Halder; 3. Bryson Ruff; 4. Jason Alder; 5. Isabella Robusto; 6. Tyler Chapman; 7. Trent Dockery; 8. George Hayes; 9. Molly Lindner; 10. Austin Mcdonald; 11. Ryan Rackley; 12. Isaak Love; 13. Justice Calabro; 14. Jake Waltman; 15. William Robusto. VP Racing Fuels Semi-Pro (25 laps): 1. Drew Dollar; 2. Sammy Smith; 3. Gracie Trotter; 4. Harrison Halder; 5. Dustin Rumley; 6. Ryan Heim; 7. Ryo Ogata; 8. Carson Poindexter; 9. Tristian Lesik; 10. Tristen Love; 11. Craig Biryla; 12. Adam Berberich; 13. Conner Mosack; 14. Vince Midas; 15. Kaylee Bryson; 16. Brandon McKenzie; 17. Joshua Plummer; 18. Faron Laney; 19. Cole Dockery; 20. Hayden Swank; 21. Daniel Knight; 22. Seth Henry; 23. Cole Brown; 24. D.J. Canipe. Legend Car Pro (25 laps): 1. Derek Lemke; 2. Dawson Cram; 3. Sam Mayer; 4. Hudson Halder; 5. Garrett Manes; 6. Chase Purdy; 7. Nick Sanchez; 8.Jake Tretow; 9. Walker Yates; 10. Tyler Lester; 11. Daniel Wilk; 12. Dillon Spain. Beginner Bandits (20 laps): 1. Alex Meggs; 2. Luke Morey; 3. Sean McElearney; 4. Natasha Elder; 5. Sklyer Chaney; 6. Hunter Jordan; 7. Nate Honeycutt; 8. Jonathan Speas; 9. Tristan McKee; 10. London McKenzie. Charter Schools USA Bandolero Outlaws (20 laps): 1. Justin Gareis; 2. Luke Akers; 3. Garin Mash; 4. Jayden Daniels; 5. Santiago Hill; 6. Carson Ramsey; 7. Zac Fowler; 8.Trevor Wester; 9. Caleb Williams; 10. Jordan Plummer; 11. Josh Speas; 12. Ethan Norfleet; 13. Emily Hedstrom; 14. Johnathan Lesik; 15. Whitney Meggs. Bandolero Bandits (20 laps): 1. Zack Miracle; 2. Landon Rapp; 3. Parker Eatmon; 4. Kade Brown; 5. Truett Miranda; 6. Stanley Hayes; 7. Jaiden Reyna; 8. Luke Cooper; 9. Lucas Vera; 10. Adam Eades; 11. Sean Abell; 12. Carter Russo; 13. Bobby Elder.